<!-Eric Gill. 1882-1940--> Eric Gill. Christmas Gifts: Dawn. 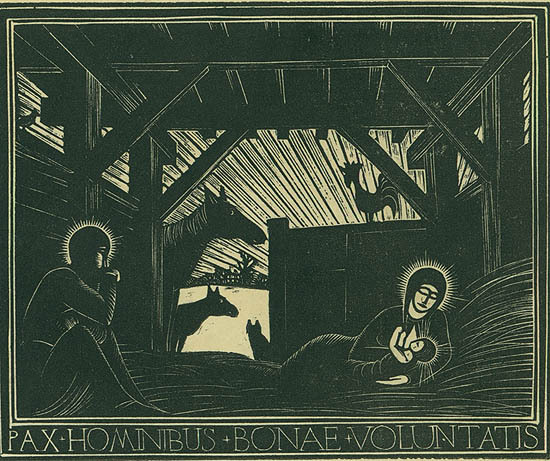 Christmas Gifts: Dawn: PAX HOMINIBUS BONAE VOLUNTATIS. 1916. Wood engraving. Physick 80. 2 13/16 x 3 9/16 (sheet 3 1/8 x 3 3/4). As published in The Game volume I, no. 2 and in Nisi Dominus. Printed on cream wove paper. Signed in pencil. $1,250.